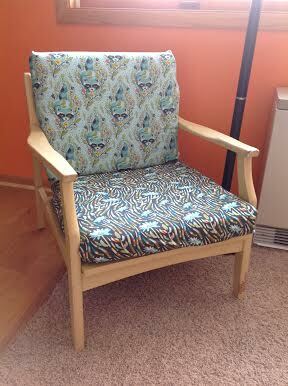 I found this deplorable chair at the thrifty store last week and have since un-uglied it. Yes, very out of date and not a nice chair to loot at. But now feast your eyes on this beaut! I bought this fabric at my favorite fabric place in the world. I could honestly stand in that cute little store and look at all the eye candy fabric surrounding me for hours. I went there with my little sis and I think she had to physically pull me out of there. The fabric store is called Hannah Johnson Fabrics and it is located in Duluth, MN. Please go there if you need to be happy, because it is such a pretty and happy place. I am pleading with the owner to perhaps be a part of a giveaway sometime in the future, how cool would that be? 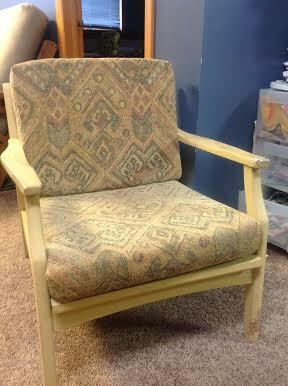 I love older chairs like this because they are easy to recover and they fit me. I love that my feet are planted comfortably on the ground, not like the new chairs that seem to swallow me up. 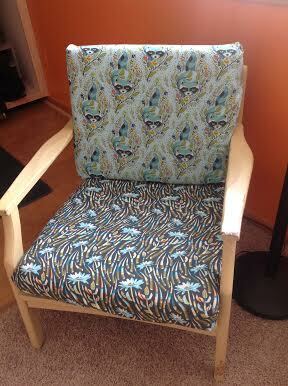 Beautiful chair, Caitlyn!! It looks brand new again and way, way cooler. That’s the best fabric store for hours in every direction!! I drive there all the way from Washburn because there is NO other store that compares in the whole northland! LOVE her selection.